Cosmetic Preservatives Market size is set to surpass USD 1.4 billion by 2024; according to a new research report by Global Market Insights, Inc.
High penetration rate of global brands, escalating demand for functional products along with growth in working women population will drive cosmetic preservatives market size. These compounds are mixed with personal care products to improve facial appearance and enhance product lifespan. Growing in customer expenditure on beautification supported by increasing ageing population will propel product demand. Beneficial government policies supported by R&D assistance on preservatives production will promote product demand. Additionally, supporting regulatory amendments by EU pertaining for use of safe chemicals in Europe may act as key contributing aspect towards the growth of cosmetics preservative market. Global cosmetic preservatives market size from skin care application is estimated to reach 25 kilo tons by 2024. It has wide usage in formation of face masks, sunscreens, scrubs and lotions. Water based skin care formulation are prone to bacterial, yeast and mold formation deteriorating product quality, phase inversion. Preservatives provide broad spectrum alternative to minimize growth of these microbes and maintain product quality over longer span of time, thereby driving product demand. New product formulations and demand for organic & herbal preservatives in cosmetics products is projected to drive regional market over forecast timeframe. Rising economic standards along with mounting consciousness about personal hygiene & grooming are likely to boost cosmetics product market growth which may in turn will augment global cosmetic preservatives market size. Global synthetic cosmetic market size is poised to outdo USD 925 million by 2024. Rising alertness regarding damaging effects of UV rays on skin is likely to spur cosmetics preservative market. Growing demand for phenoxyethanol which has application in lotions and creams owing to its importance as gentle cosmetic preservatives is likely to boost product demand over the forecast period. Cosmetic preservatives manufacturers are substituting parabens with safer and effective product like Benzyl alcohol. It is a latent alternate to parabens due to its wide spectrum and capability to avert growth of yeast, mold and bacteria in cosmetics. Although cost of alternate preservatives is comparatively higher, consumers are ready to spend additional on paraben-free products. 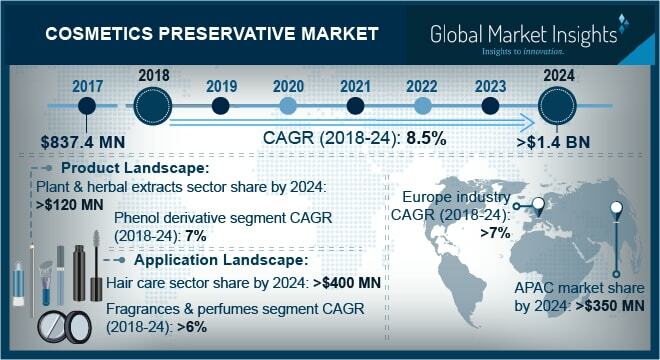 High cost of natural preservatives due to extensive manufacturing process may affect cosmetic preservative market price trends, thus affecting industry profitability. Moreover, estrangement regulatory standards may incur additional compliance cost, which is likely to limit industry growth. Germany parabens cosmetic preservatives market size is likely to reach 1.5 kilo tons owing to its usage in conditioners, shampoos, sunscreen lotions and anti-aging cremes. These chemicals have similar features as organic products due to high effectiveness as bactericide and fungicide properties, along with manufacturers acceptance as it offers high compatibility, thus prompting cosmetic preservatives market size. China cosmetics preservative market demand from toiletries application may witness significant growth of over 6.5% by 2024. Rising living standard of consumers along with large scale of economies has impelled demand for toiletries in this region and is likely to boost demand for cosmetic preservatives in this segment. Global cosmetic preservatives market share is competitive and moderately consolidated with key industry precipitants includes Chemipol, Lonza Group, Brenntag, Dow Chemical Company, Brenntag, BASF SE, Ashland Inc and Akema Fine Chemicals. Increasing consumption of beauty products has impelled vendors to invest profoundly in R&D for cosmetic preservatives. Companies are spending more on product design, manufacturing phases, Innovation and commercialization.